Kevin Sbraga at Juniper Commons before its opening in 2015. The Fat Ham in King of Prussia, the remaining restaurant in Top Chef Kevin Sbraga's onetime mini-empire, will close after business Sunday, after nine months. "Ultimately, I grew too fast and wasn't prepared for what I had in front of me," Sbraga said Wednesday after informing his 20 employees at the mall. Sbraga said he would consult and go to work for someone else — just as he did during the early days of his career, when he worked for Georges Perrier and Stephen Starr. Sbraga was a meteor through much of his short career as a restaurateur, opening five highly visible restaurants in less than five years, and seemed to symbolize the high-flying celebrity chef. On Wednesday, he took the bus home to Center City from King of Prussia after his announcement. His Chevy Tahoe had been repossessed. "I was unemployed and didn't have a car in 2009," he pointed out, referring to a period just before his audition for Top Chef, the Bravo reality series that he won in 2010, its seventh season. Though a seasoned chef, the Willingboro native, now 38, had no experience opening or operating a restaurant. But he did have eager investors. The stylish, eponymous Sbraga at Broad and Pine Streets opened in 2011 in the Symphony House to praise for its fixed-price menu, especially for the foie gras soup. Critics may have been impressed, but "Sbraga had a rough start," the chef said. "Year two is when things turned around and we had built up confidence." 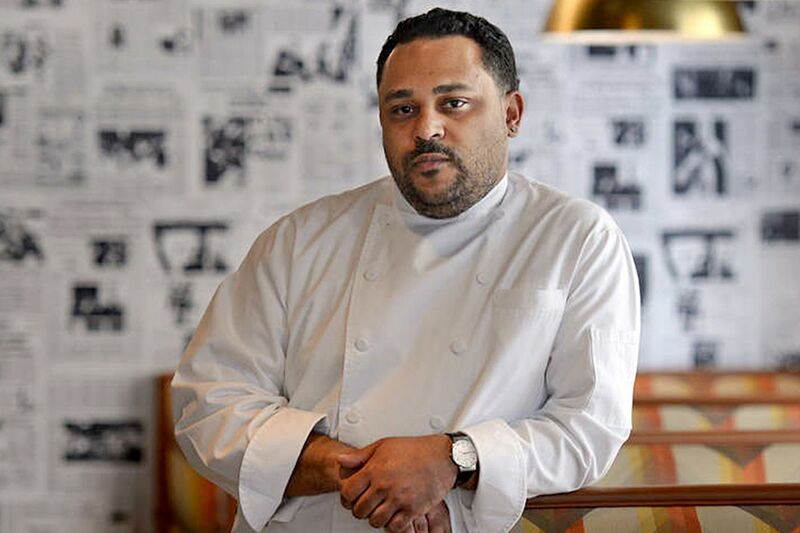 Then he opened the Fat Ham, a much more casual Southern restaurant specializing in hot chicken, in the Left Bank at 3131 Walnut St. in University City. "Once we opened the second one, a lot of opportunities came in," Sbraga said, mentioning Juniper Commons — a retro-theme American restaurant at Broad and South Streets that flamed out in six months — and Sbraga & Co., a restaurant in Jacksonville, Fla., that he oversaw in a management deal; that lasted less than a year. He acknowledged problems in Juniper Commons' concept and details. The second Fat Ham opened last September at King of Prussia's food-centric expansion. But Sbraga and the University City Fat Ham struggled in early 2017 and closed in January. King of Prussia was not performing either. "A lot of people could see it coming," Sbraga said. "It's been really slow." Plans to change the concept were debated among the mall and his partners, but nothing happened, he said. Reflecting on the six years, Sbraga said: "I still love every minute of it. I wouldn't trade that in for anything." He added: "Oh-for-five isn't good." "I won't say that I won't but I don't know if I'll ever own my own business again," he said. "If I do, I'll have to own it 100 percent, including the real estate. My father had his own bakeries, but the main one — for 44 years — he owned the business and the real estate under it. "I looked at my high school yearbook and in there is a picture of me as a kid and what I dreamed of doing," he said. "One was marry my high school sweetheart, go to college, work in a hotel, and open my own restaurants, and I did everything on that list." He and his wife, Jesmary, are divorced. They have two children. He said his immediate and longtime plans are to take care of his children. He said he did not know what would become of outstanding debt, including gift cards. "I'm disappointed in how many people I've let down," he said. "The hundreds of employees, the thousands of guests, the vendors, the landlords, the partners." When asked what he would have done differently, he replied: "I don't think I would have grown this quickly. I would have done a better job of really embracing the guests and embracing the employees. I had a lot of great people working with me, and I wish I could have kept them." Sbraga said hot chicken would be sold for half-price from noon to 3 p.m. Sunday, the last day.